The Umauma Falls Zipline Experience (4) line Zipline Experience will allow you to zip up to one mile with spectacular zipping through paradise, over many waterfalls and ocean views This experience is fantastic. It is a thrill, it is fun, it is a feast for the eyes and soul. If you love waterfalls then this is a must! At line # 2 you get to race your partner down our 1700' dual line , you will have time to view the beautiful scenery which includes a view of a 100 foot waterfall as you look toward the top of Mount Mauna Kea on this . 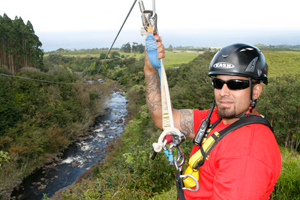 On line #4 you will zip over 2200 feet of river water and many falls. Wow! This is so amazing you will pinch yourself that you are actually here. Does this activity Require a waiver? : Yes Inclusions: Drinks and Snacks provided during the zipline tours. Duration: 4-Line 1.5 hrs Availability: 7 days a week Black-out dates: Christmas and Thanksgiving (Closed) Directions: 31-313 Old Mamalahua Highway Hakalau, HI 96710 808-930-9477 (zips) Located at: 31-313 Old Mamalahoa Hwy. Turn toward the mountain on Kauniho Rd. near mile marker 17 north of Hilo, then left on Old Mamalahoa Hwy. Cross the Umauma River and turn right under the sign "THE UMAUMA EXPERIENCE" and you are here! No-Transportation Provided Times: 4-Line Zipline: 9am Check-In at 8:30am 10am Check-In at 9:30am 12pm Check-In at 11:30am 1pm Check-In at 12:30pm No-Transportation provided. Restrictions: Ages 10 and up, 80 lbs. - 250 lbs. for ziplining. No unaccompanied children under 18 years of age. Parent or guardian must remain on-site. Moderate to advanced physical activity, no experience necessary, expecting mothers and those with serious medical conditions as well as persons with prior back and neck injuries are not permitted to participate. Closed shoes and knee-length shorts required, industry standard 48 hour cancellation policy applied for full refund. We reserve the right to refuse service. Other restrictions may apply.